Gem rides around in an Eclipse 2 horse straight load aluminum trailer. Is it absolutely perfect? No. But I actually really like the trailer and it fit all our needs at the time of purchase. I have no plans on selling it ever and after owning it for 3 years it was about time to personalize it a bit. My only real issue with the trailer is that the tack area is also the walk through/emergency door for loading the horses. It is a decent size, but most things were stored in a large muck bucket on the floor and I tended to trip over or step on items. The last straw was two weeks ago when I tried to open the trailer vents (with the trailer being so ridiculously tall, I have to stand on something to do this) and stepped down and tripped landing on top of my brand new bottle of fly spray squishing the bottle and popping the top off. Fortunately, I was able to attach the nozzle of a different bottle to pry this one back into a straight position and get it working again. But I had had enough. 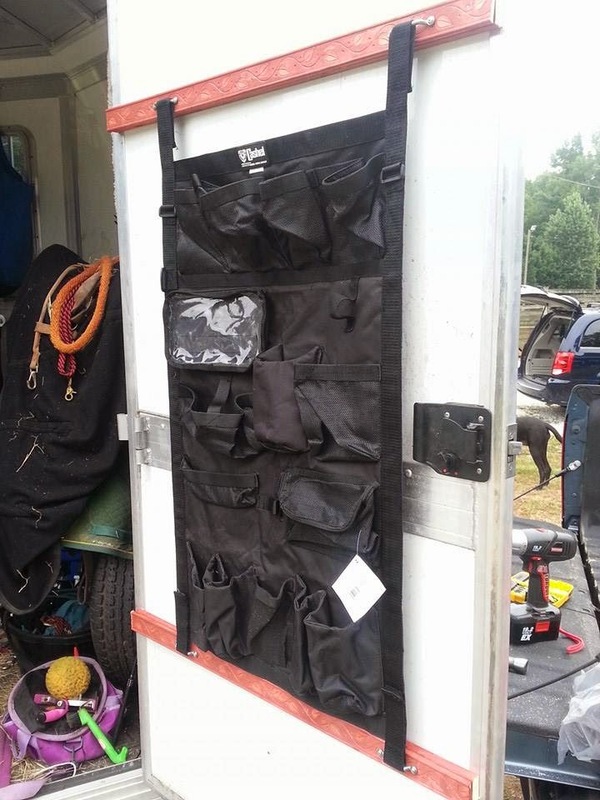 I had ordered it with the new chaps, but had run into a small complication with using it and so it sat in the trailer being useless and taking up yet more essential floor space. What was the complication? The trailer is aluminum to cut down on both the annoyance of dealing with rust creating steel as well as weight. That's fine. But the door and walls themselves are fiberglass (I think...well they are something other than metal of any sort) and that limited the ability to hang the above contraption since the width from aluminum post to aluminum post was too wide and the length was too long. I really wanted it on the door and low enough that I could reach everything from the ground. We needed to do something to safely hang the unit and so we stopped at Lowes and picked up some pieces of wood to go from end to end of the door at whatever height I wanted. Then the hardware for the organizer could be hung onto these and voila! So we got the wood, but it was boring wood. I happened to walk past some decorative wood meant for something I suppose...maybe a railing or something. Anyway...much to the hubby's annoyance I grabbed a piece of that too to make it look prettier. Then...having pretty on the brain...I looked at staining options. Everything I have horse related is red and black. There was one staining option that was red looking and so I grabbed a can and headed to the paint department to get it mixed up. I chose Antique Red because it was a little darker looking and in 5 minutes they had it ready. The person didn't offer to open the can and I was already taking too long for a quick 10 minute stop (30 minutes later :) so I grabbed it and headed to the check out. You can guess where this is going, right? It was 5 pm Saturday night and I wanted it stained and dry by morning. I got everything ready and opened up my can to see....purple stain. Umm? It wasn't even anywhere close to being red or reddish or pink or any shade/hue close to red on the color wheel. Darnnit! Back to the store I went worried they wouldn't take it back. But they did without a question and I grabbed another can of base and headed to the paint department. I chose a new color (China Red) in case the other color recipe was messed up and I ended with purple again. The guy (same one as last time) handed it to me and I asked him to open it this time. It was red!! Back home and I put W to bed and headed out to stain the wood. It really didn't turn out quite "red" more of a terracotta color, but it is red enough for me. Sunday morning I had the hubby drill holes into the aluminum (ick...I guess the trailer is ours now!!) and he hung the board up across the width of the trailer door at a height reachable for me from the ground. He then tacked on the pretty top boards (the picture we have it crappy but it has a vine and leaf pattern running the length of it) and then the hardware for the organizer. It works perfect!!! 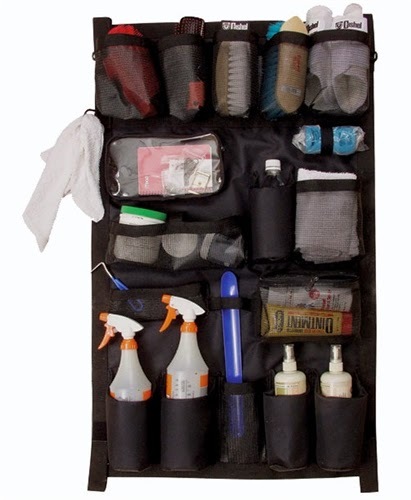 I holds all my fly spray bottles, grooming brushes, belly balm, hoof pick, her ear bonnet, etc... There are two hooks as well and I used these to hang our bits up off the floor. The plastic zipper pouch velcros on/off and I put my AERC card and coggins papers in there. That way I can just grab it and go to the vet in keeping it all organized. I am sooo happy with it. The trailer looks so much better and everything is super easy to reach. I can't wait to really use it. Next time I make it to the barn I will grab better picks!